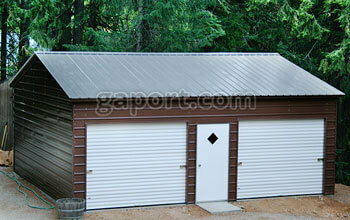 These affordable and durable metal garages can serve a variety of uses for your home, farm or business. 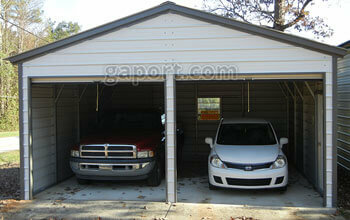 They prove year after year to be a more affordable alternative to stick built garages. Not only are they more affordable but they are also very solid, equipped with a wind & snow ratings where it is needed. 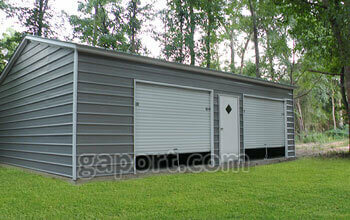 These metal garages are truly a cost effective and maintenance-free alternative for your valuables. How do we do it? 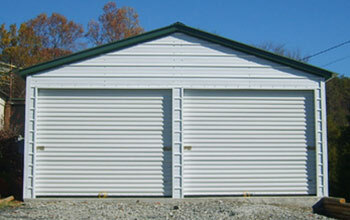 We are able to offer you these steel buildings through a network of metal garage manufacturing facilities located throughout the U.S. Each of these manufacturing facilities has installation teams to install your garage in a timely fashion. Installation by experienced factory-trained crew in 27 states makes your next garage purchase a truly pleasurable experience. 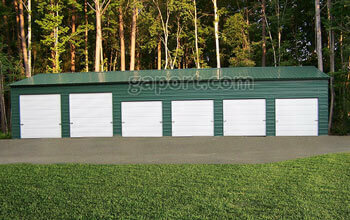 Through proper design of your garage - you can accommodate many vehicles, tractors, loaders, RVs and boats. 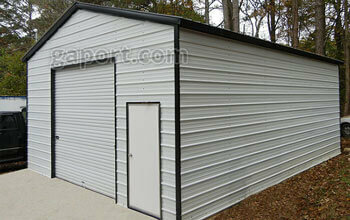 Please notice some of our samples below..
O Our steel buildings truly have a wide variety of uses. 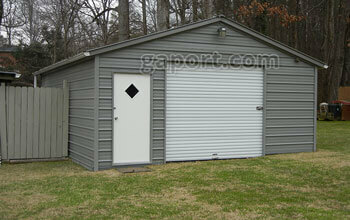 Over the years our metal garages have been used for residential, commercial and industrial applications. 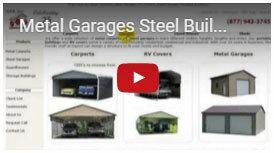 All of the steel garage illustrations above are simply samples. 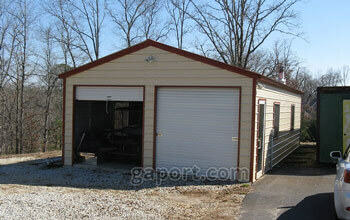 We do not have a model per se because everyone wants a garage tailored to their application. 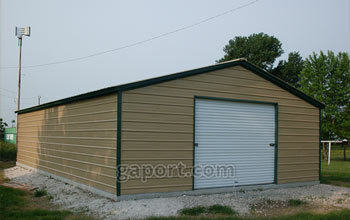 Therefore, you can build your steel building to fit exactly what you are trying to store. Our most frequently asked question is, "Does the price include shipping, anchoring and installation within the normal service area?" The answer is yes. The prices on the following pages include shipping, anchoring and installation on your level site in our normal service area in these 34 states. 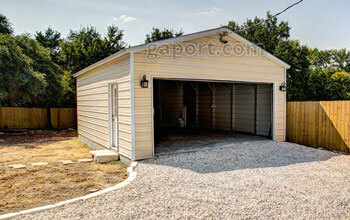 Another frequently asked question, "How long would it take before a garage was installed on my site?" 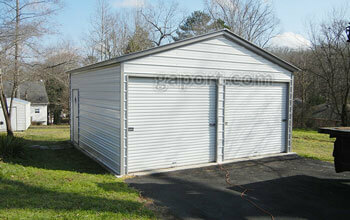 Are the prices for steel garages current? Select a 24′ x 25′ x 8′ leg height garage with 14 gauge base price + one 9′ x 7′ roll-up door + one 9′ x 7′ roll up door + one walk-thru door and one window. 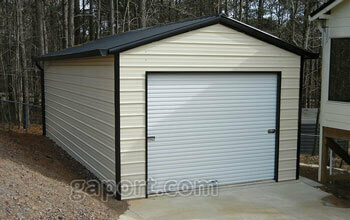 Select an 18′ x 20′ x 9′ leg height garage with 12 gauge base price + one 10′ x 8′ roll-up door + one window. What if I want a 30′ x 60′ garage with 12 gauge framing, three 10′ wide x 10′high roll-up doors in the 60' long side wall, 2 walk-thru doors and 4 windows? 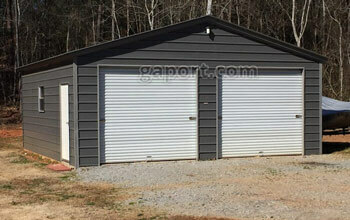 Select a 30′ x 60′ x 12′ leg height garage with 12 gauge base price + one 10′ x 10′ roll-up door located in the side + one 10′ x 10′ roll-up door located in the side + one walk-thru door + one walk thru door + 4 windows. Select a 22′ x 30′ x 10′ leg height garage with 14 gauge base price + one 10′ x 8′ roll-up door in the side + one 10′ x 8′ roll-up door in the side + one walk-thru door + one window. 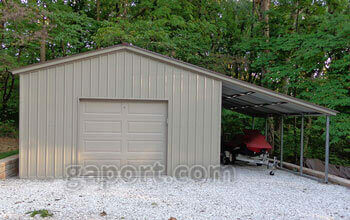 Can I have my steel garage custom sized; I don't see the size I need! No, you may choose one color for the roof, a different color for the trim, a different color for the sides at no additional charge. You may also choose to make all of the colors the same on your structure, it's your choice. Please view available garage colors. 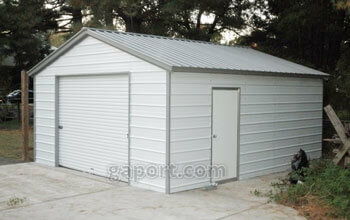 Can I buy the metal garage materials and assemble it myself? Unless you are purchasing a garage for the federal government, state government, have a farm or agricultural exemption or have a sales tax exemption number and are willing to sign a sales tax exemption form, you have to pay sales tax, or live in a state that is free of sales tax. 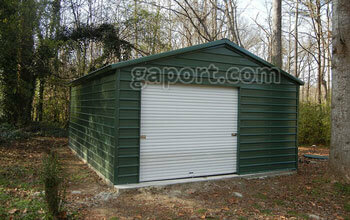 What factors may add to the cost of the metal garage? 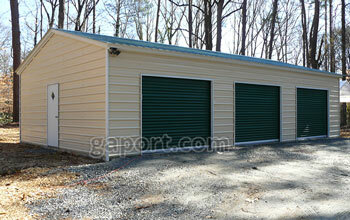 Installation on a commercial, government or industrial site additional fees may apply. Please contact us. 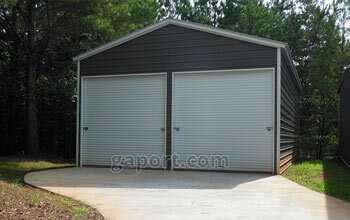 Is there a discount if I purchase more than one garage? What colors can I choose from for my garage? 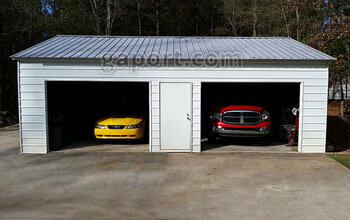 We have 15 different colors to choose from for your car port. You may choose one color for the roof, a different color for the trim, a different color for the sides at no additional charge. View the standard delivery truck and trailer. The 3 member installation team brings the material with them and construction begins immediately upon arrival. 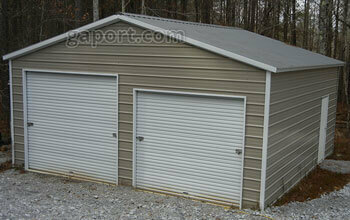 What is the warranty on the steel garages? 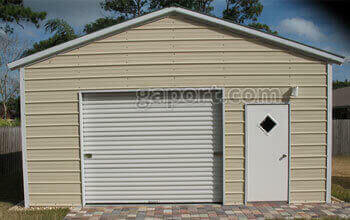 What is the gauge and size of the metal frame and sheet metal used for my garage? 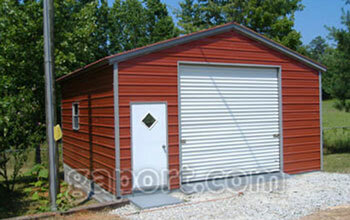 We&apos;ll make a steel garages as long as you need. No, we will not attach to other structures. A very interesting viewpoint regarding pricing. 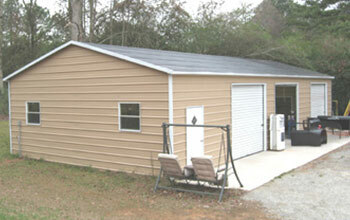 We can install ¼” double-bubble insulation in the units that we build. 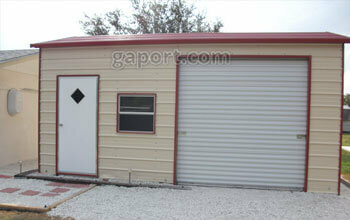 The price is $1.00 per square foot (of side-wall, end-wall, and roof square footage). It has an R-Value of 4.3. Check out our insulation cost caltulator. NOTE: Perimeter sealing at the foundation at the foundation of the metal garage, if necessary, is the responsibility of the purchaser. Can I have the garage built now on the ground and then pour concrete inside later? Yes, that is possible but certainly is not recommended. You turn out with a much better floor finish and appearance if the floor is poured ahead of time. 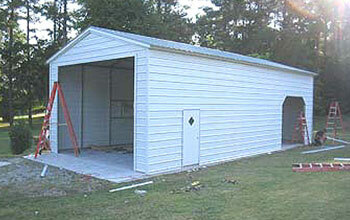 View how a garage is assembled. All garages with 8' legs or higher come standard with a minimum of 5 peak braces and a brace at every leg where possible. 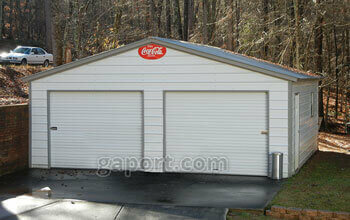 Most garages have a roof pitch that is approximately 4:12 and it cannot be changed. 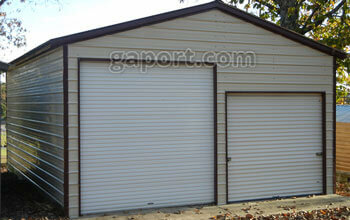 For 26′ to 30′ wide garages the post are spaced no more than every 3′6". 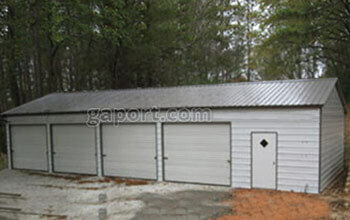 Garages can take anywhere from 1 - 2 days to assemble depending on the options that were ordered and the size of the garage. 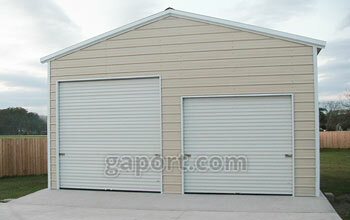 Although, there are exceptions, the rule of thumb is, if the garage doors are to be placed in the end (width) of the garage the leg height must be 1’ taller than the height of the garage door(s). 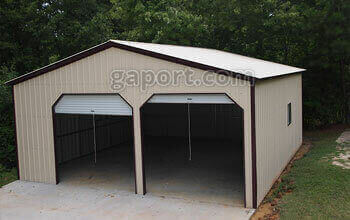 If the garage door is to be placed in the side wall (length) of the garage, the leg height of the garage needs to be 2′ taller than the height of the garage door(s). (i.e. 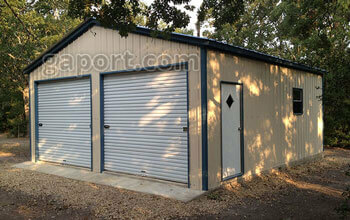 24′ wide x 40′ long x 9′ leg height with two 9′ wide x 7′ high roll-up doors placed in the 40′ side wall. 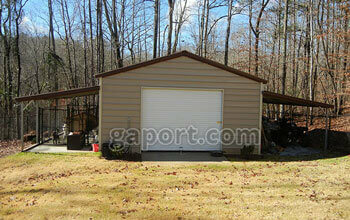 Result is 2′ higher leg height of garage than the height of the garage door). Pour slab ¾ ” wider in width and the same length. 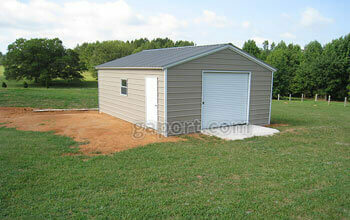 As an example for a 24′ x 40’ garage a slab should be a minimum of 24′ ¾” x 40’ long. 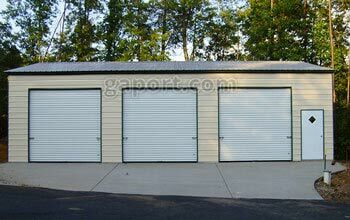 Is it possible to add electric garage door openers to the garage doors? 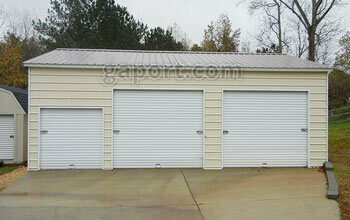 Our garage doors are roll-up steel 'coil' type doors. They work great, however, an electric motor option is not available. If you are in a circumstance that requires an electric garage door opener you can always have us install the garage with an opening per your dimensions. Then after the garage construction is completed by us, you or a local garage door contractor can install a garage door with an electric garage door opener to fit your needs. 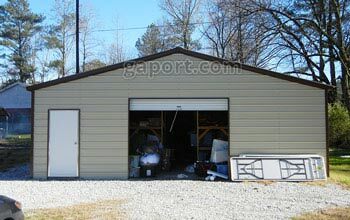 What type of roof does this garage have? 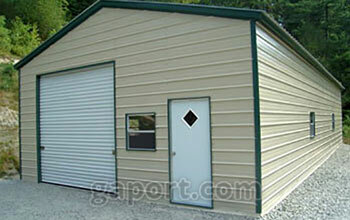 All of our garages are quoted with the far superior vertical style roof. Why is it superior? A vertical style roof is far less prone to leak. 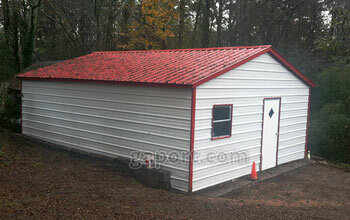 The roof does not hold water, leaves, pine straw and other debris. It also has a natural ridge vent and a more pleasing appearance. 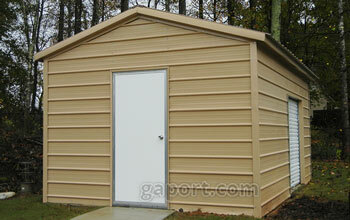 Wherever you buy insist on the vertical style roof. 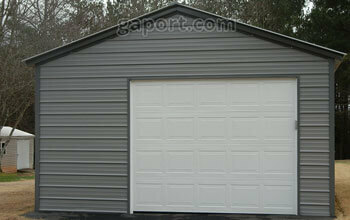 Please take a look at the vertical roof illustrated on a metal garage.